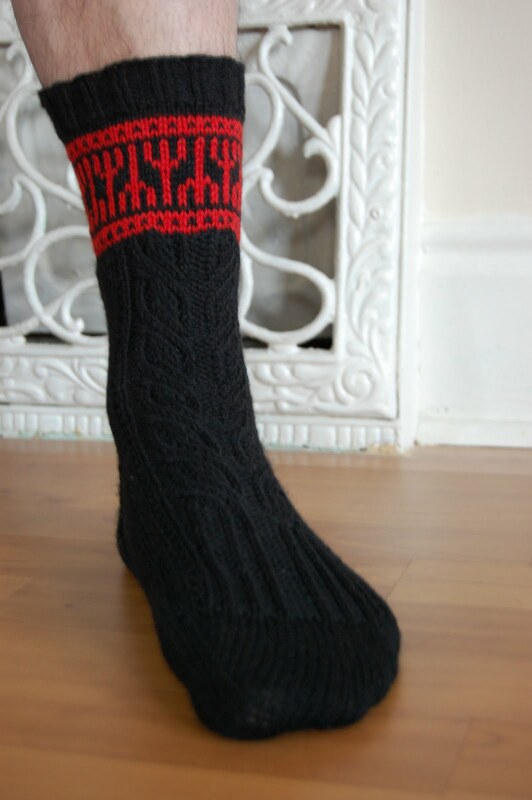 Last night saw the release of my newest sock pattern, the devilish Socks for Declan. The pattern has assumed the flesh (so to speak) is now happily among us. Should you wish to allow him to introduce himself, forget about seeking out a suitable deserted crossroads -- just click the wee button above, head over here to Ravelry or take a sharp left and make your way to my Etsy shop. Of course, if you'd like to meet the works that inspired this flamboyant footwear, allow me to introduce you to both Glen Duncan's wonderful novel I, Lucifer and its equally delightful soundtrack by The Real Tuesday Weld. The Fall has never been so charmingly witty. So lay aside those good intentions -- as they say, half the fun of going to hell is getting there. Where did I put my handbasket?! April 7, 2011 at 10:07 a.m.
Oh, we'll be providing those! April 7, 2011 at 10:23 a.m.
April 7, 2011 at 11:13 a.m.
April 7, 2011 at 11:44 a.m.